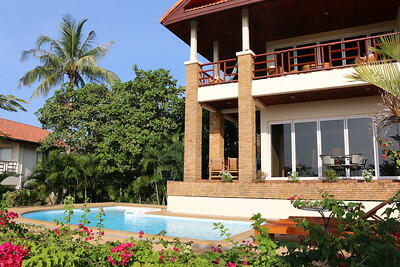 Issara villa is a 4 bedroom villa built in a quiet housing estate. The villa sits off to one side of the estate in between two other villas allowing you direct ocean views over landscaped gardens from the front of the home. 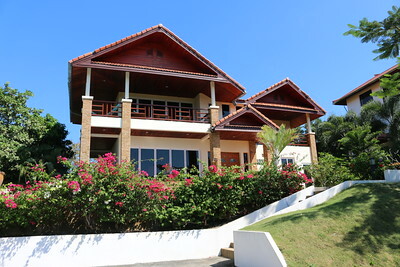 The upper Level of the villa is designed so everyone can relax and enjoy the sea views. Indoor there is a large lounge area with glass sliding floor to window doors, leading out to an outside terrace with another sofa set. 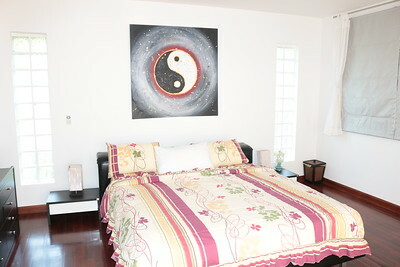 The master bedroom is the largest room in the villa and also located upstairs. 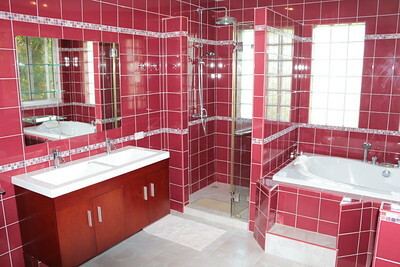 The bedroom enjoys a very impressive large ensuite bathroom with jacuzzi bath tub, separated shower cubicle with a power shower and double wash basins. 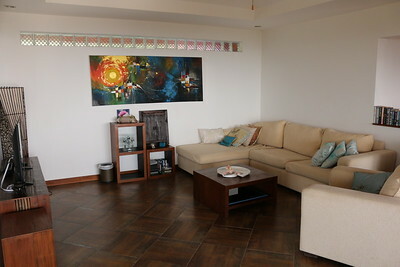 The bedroom also has its own private balcony terrace for a little escape time. On the lower level at the back of the villa are three of the four bedrooms. 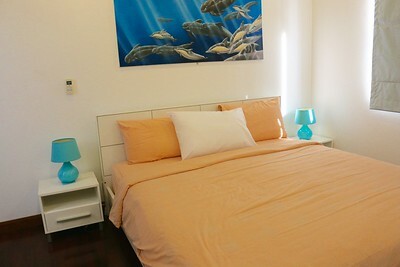 Two are double bedrooms with their own private bathrooms, the third bedroom offers a smaller bed which is great if you are traveling with children. 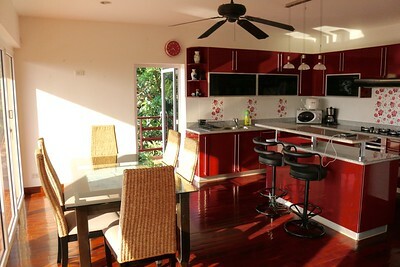 At the front of the villa is a stunning kitchen with breakfast bar and dining area. 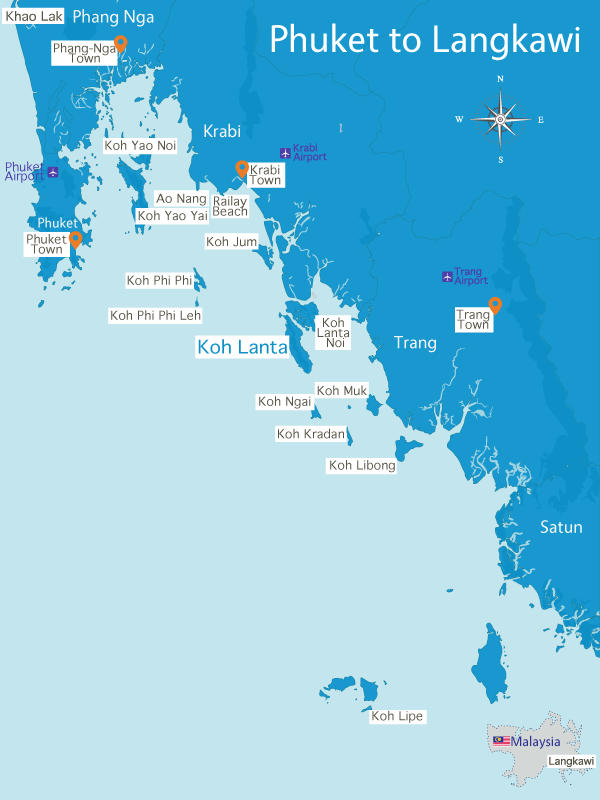 The kitchen is fully equipped with oven, hob, fridge freezer, microwave, toaster, kettle and a coffee maker. Enjoy your morning coffee inside or by the pool terrace with more seating options. 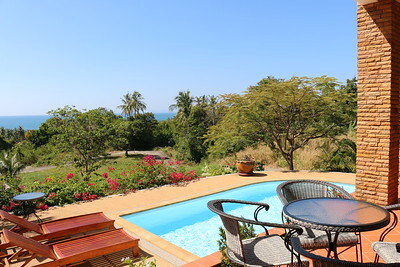 The pool is at the front of the home offering great views of the sea and at the same time you will have plenty of privacy from other properties with surrounding trees. The outside has a terrace area which is shaded by the roof and for relaxing and sunbathing sun loungers are laid out by the pool.